The purpose of the Extended Day Program is to provide a safe and supervised environment for students who need before or after school care. The program supports the Mission Statement and Beliefs of the school and works in cooperation with the parents, teachers and administration to best benefit the students enrolled in the program. 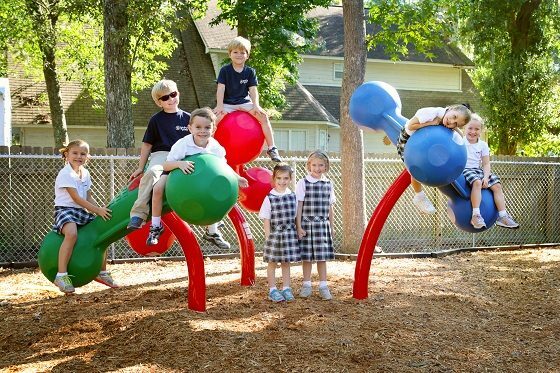 The program follows the guidelines and regulations set by the State of Georgia and the Diocese of Savannah regarding childcare for students between the ages of four and twelve. The EDP Aftercare opens the first Full day of school in August, Monday through Friday, 3:00 to 6:00 pm on regular school days and 12:30 to 6:00 pm on early dismissal days. Before Care Hours are Monday-Friday 7:00am-7:45am. Any student dropped off at school before 7:45am, must go to Before Care. EDP Registration Forms, Policies and Procedures and Fee Schedules are below. Please note: Diocese Policy states that if you want your child to attend EDP, all payments must be billed through your FACTS tuition payment system account. Instructions for setting up a FACTS account if you do not have one, are listed on the Fees and Rates Form below. If you have any questions about EDP, please call the school office at (912)897-5224. Early Birds: Students can be dropped off as early as 7:00 am. 7:00 – 7:45 Free Play: puzzles, Lego, writing center, cars, books, independent art activities, etc. Aftercare: Students are dismissed at 3:00 pm to EDP. Free choice for those without homework and as they finish, art, Lego, books, cars, games, blocks, etc.